1. 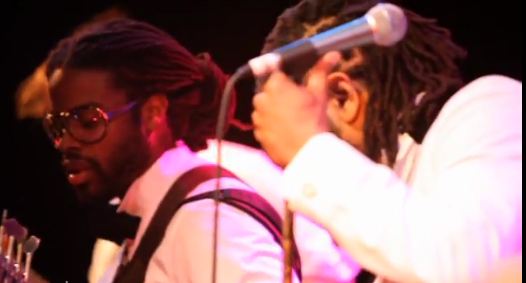 Adrian Younge and Black Dynamite Orchestra Live performing at the Converse Tux’n’Chucks event. 2. Performing live at the Beat Swap meet. The Black Dynamite score is a concept album that exhibits my affinity for vintage soul. My influences were predominantly blaxploitation and European soundtracks of the 1960s and ’70s. I sought to revitalize this golden era in hopes that the listener would value my compositional perspective and predisposition for linear analog recording. My Black Dynamite journey commenced when director and fellow DJ Scott Sanders approached me with the proposition to edit and score a prospective blaxploitation film. Weeks later, Sanders, Byron Minns (Bullhorn), Michael Jai White (Black Dynamite), and I formulated a plan to get this film into fruition. In anticipation of a potential financier, we edited a trailer, they wrote the script, and I prospectively recorded the music. To our surprise, the plan worked; I was hired to create the score for Black Dynamite and edit the film.For the score, I served as the composer, principal musician, and recording engineer. Today, this is fairly commonplace, because most composers utilize modern synthesizers and computers. I chose not to take this route for two reasons: first, I have an aversion to the nonlinear processing of digital recording; second, I wanted to emulate the techniques of the ’70s in order to maintain the integrity of the score.As a composer, my goal was to stimulate emotion; as a musician, I studied the instrumentation of superlative vintage soul; as a recording engineer, I utilized golden-era recording techniques to denote the nostalgic sound of early cinema funk. However, as a professional artist, I had to streamline these goals in a manner that did not stifle the film’s production, yet satisfied personal standards.The process was long, difficult, and often debilitating. This is because period recording represents the union of specific nuances ultimately creating a unique sound. In sharp contrast to modern-day recording techniques, each nuance generally requires some sort of antiquated method. However, this old process is the basis for why vintage music sounds so rich. Thereupon, the foundation for my period recordings is vintage instruments, microphones, microphone preamps (mic pres), and analog tape machines.Vintage equipment is tantamount to a good period recording, because contemporary equipment is manufactured to produce a modern sound. My instruments are all pre-1979 (some dating back to the ’30s), microphones are pre-1970, mic pres are pre-1965, and my tape machines are all pre-1978. The recording process proved difficult, especially because I produced the score with little or no engineering support. In addition, I was constrained for time: I edited film for Black Dynamite twelve hours a day, served as a law professor, and worked on the score nightly. In retrospect, the challenges of this project proved difficult; however, my passion overrode inconvenience, and my satisfaction, through accomplishment, is now incalculable. In all, I sought to make a bona fide score by synthesizing the great musical ideologies of a lost era. My integrity prohibited the mere rehashing of the music of this time; it forced me to place a contemporary spin on its ingenuity. I truly admire the musical icons of yesterday and hope this score revitalizes the lost art of vintage soul recording. This entry was posted in Video and tagged Adrian Younge, Black Dynamite, Black Dynamite Orchestra, chicken grease, Live, soulROCKS TV. Bookmark the permalink. Follow any comments here with the RSS feed for this post. Post a comment or leave a trackback: Trackback URL.